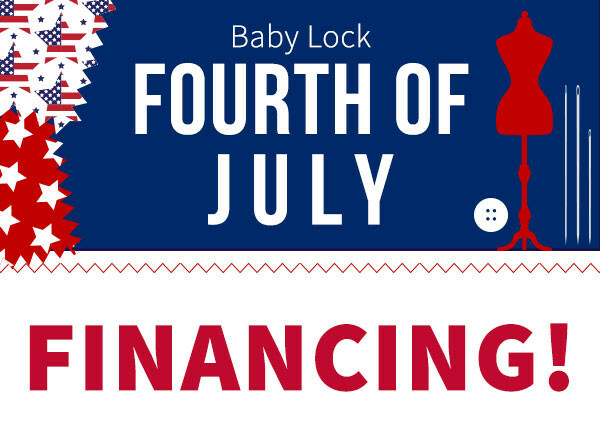 No Interest Financing for 18 or 36 months on Baby Lock machine purchases over 2,000! Offer valid June 27-July 10, 2018. No Interest Financing for 18 months on purchases over $2,000 available! This special payment offer valid 6/27/18 to 7/10/18. See your authorized participating Baby Lock Retailer today. Payment Terms and conditions: Offer applies only to single-receipt qualifying purchases of a Baby Lock machine purchase of $2,000 or more. Interest will be assessed on promo purchases of $2,000 or more from the purchase due date at a reduced 0% APR for 18 months and during promotional period fixed monthly payments are required and equal to 1/18th of initial promo purchase amount when you use your Synchrony card. However, if account becomes 60 days past due, the promo may be terminated early and regular account terms will apply. The fixed monthly payment may be higher than the minimum payment that would be required if the purchase was a non-promotional purchase. Regular account terms apply to non-promotional purchases, after promotion ends and to promotional purchases. For new accounts: Purchase APR is 0%; Minimum Interest Charge is $2. Existing cardholders should see their credit card agreement for the applicable terms. Subject to credit approval. Offer valid only at authorized participating Baby Lock Retailers in the United States. No Interest Financing for 36 months on purchases over $2,000 available! This special payment offer valid 6/27/18 to 7/10/18. See your authorized participating Baby Lock Retailer today. Payment Terms and conditions: Offer applies only to single-receipt qualifying purchases of a Baby Lock machine purchase of $2,000 or more. Interest will be assessed on promo purchases of $2,000 or more from the purchase due date at a reduced 0% APR for 36 months and during promotional period fixed monthly payments are required and equal to 1/36th of initial promo purchase amount when you use your Synchrony card. However, if account becomes 60 days past due, the promo may be terminated early and regular account terms will apply. The fixed monthly payment may be higher than the minimum payment that would be required if the purchase was a non-promotional purchase. Regular account terms apply to non-promotional purchases, after promotion ends and to promotional purchases. For new accounts: Purchase APR is 0%; Minimum Interest Charge is $2. Existing cardholders should see their credit card agreement for the applicable terms. Subject to credit approval. Offer valid only at authorized participating Baby Lock Retailers in the United States. To find your nearest retailer, click here: (http://babylock.com/retail-locator).